Since May, 2009 12,062 MBBS seats and 9925 PG seats have been created. 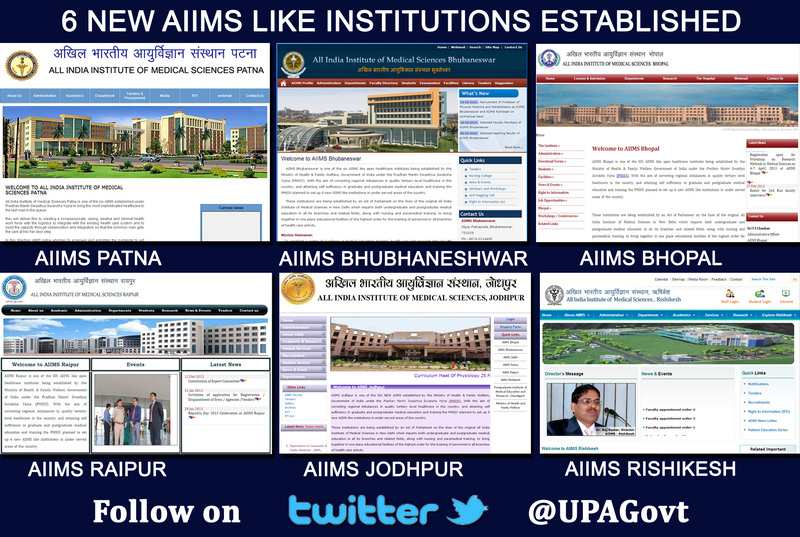 72 new medical colleges, including six new AIIMS, have been established since May, 2009. * For the academic year 2013-14, 913 new PG seats have been created. Last date for UG seats and opening of new medical colleges for academic year 2013-14 is 15.07.2013. To meet the shortage of faculty in pre and para-clinical disciplines and to ensure availability of specialists at PHCs/CHCs/District level providing service guarantee under NRHM, the Government is implementing a Centrally Sponsored Scheme for “Strengthening/upgradation of State Government Medical Colleges for starting new PG courses/creating PG seats”with fund sharing between the Central and State Government in the ratio of 75:25. Out of total central share of Rs. 1350 crores, a sum of Rs. 686.02 crore has been released to 72 medical colleges upto 31.03.2013. The details of state-wise release under the Scheme are at Annexure-III. 4147 additional PG seats would be created under the scheme. Land requirement relaxed from 25 acres to 20 acres. In Metropolitan cities of Mumbai, Kolkata, New Delhi and Chennai and ‘A’ class cities of Ahmedabad, Hyderabad, Pune, Bangalore and Kanpur, requirement of land would be 10 acres. Land requirement of 10 acres extended to three other cities with population of more than 25 lakhs viz. Jaipur, Lucknow and Surat. In hilly areas and notified tribal areas, North Eastern States and Union Territories of Andaman & Nicobar Islands, Daman & Diu, Dadra & Nagar Haveli and Lakshadweep land can be in two pieces at a distance of not more than 10 km. The relaxation to set up a medical college in two pieces of land and to utilize an existing hospital extended to 8 underserved states of Bihar, Chhattisgarh, Jharkhand, Madhya Pradesh, Orissa, Rajasthan, Uttar Pradesh and West Bengal for 5 years. The relaxation has been further extended to the remaining States as well to enable state governments to set up new medical colleges by utilizing the existing district hospitals. Requiredbed occupancyin North Eastern States & Hill States reduced. Requirement of infrastructure like institution block, library, auditorium, examination hall, lecture theatres, etc. has been rationalized for optimal use. Companies registered under the Companies Act allowed establishing medical colleges. Maximum intake at MBBS level has been raised from 150 to 250. For the academic year 2013-14, enhancement of intake capacity at UG level from 50/100 to 100/150 seats allowed without inspection by MCI during the first year (amendment being notified). The ceiling on age limit for appointment as medical faculty has been raised from 65 to 70 years. DNB qualification has been recognized for appointment as faculty to take care of shortage of faculty. The ratio of teachers to students has been revised depending on disciplines and availability of faculty. Postgraduate and Graduate medical degrees of five English speaking countries (US, UK, Canada, Australia and New Zealand) have been recognized in India. Additional marks will be given in the Post Graduate Entrance Examination at the rate of 10% for each year of rural service subject to a maximum of 30%. One years’ rural posting after passing MBBS has been made compulsory for getting admission in PG courses (amendment being notified). Reservation policy of individual states, fee structure prescribed by the State Committees and the distribution of seats in different quotas would not be disturbed. NEET-PG was conducted by National Board of Examinations during 23.11.2012 to 06.12.2012 in computer based test mode. NEET-UG was conducted by Central Board of Secondary Education (CBSE) on 05.05.2013 in paper pencil mode in 6 regional languages viz. Assamese, Gujarati, Marathi, Bengali, Telugu and Tamil in addition to English and Hindi. The exam was also conducted in Urdu in the state of Maharashtra as per the directions of Supreme Court. Court cases have been filed by a number of private medical colleges and State Governments of Tamil Nadu and Andhra Pradesh against NEET, which have been transferred to the Hon’ble Supreme Court. The Hon’ble Court gave interim directions that MCI/DCI/states/institutions can hold their examinations but result would not be declared till the final judgment. Subsequently, the court withdrew the ban on declaration of results and the final verdict in these cases is expected to be delivered in July, 2013. A three and a half years’ Bachelor of Science (Community Health) course which was earlier named as Bachelor of Rural Health Care is proposed to be introduced. to create mid-level health professionals, who will primarily be deployed at Sub Centres and would possess the necessary public health and ambulatory care competencies to serve rural population. The modalities of introduction of the course are being finalized. The matter was also examined by the Department related Parliamentary Committee which opposed the course. A Cabinet Note for not accepting the recommendations of the Standing Committee has been submitted to the Cabinet. Subsequent to the President’s address to the Joint Session of Parliament on 04th June 2009, a Bill for setting up a National Commission for Human Resources for Health (NCHRH), as an overarching regulatory body for health sector to reform the current framework and enhance supply of skilled personnel, was introduced in the RajyaSabha on 22nd December 2011 which referred the Bill to Department related Parliamentary Standing Committee. The recommendations of Parliamentary Committee have been received and are under examination. The new scheme is proposed with the objective of establishment of about 55 new medical colleges by upgrading district hospitals preferably in underserved districts of the country. The total proposed outlay of the central government share is Rs. 8500 crores. The centrally sponsored scheme has the provision of fund sharing between the Central Government and States in the ratio of 90:10 for NE/special category states and 75:25 for other states. The proposed funds for each medical college are Rs. 200 crores, out of which Central Government share would be Rs. 180 crores for NE/special category states and Rs. 150 crore for other states. This initiative would result in about 5500 MBBS seats in the country. The new proposed scheme intends to add about 10000 MBBS seats in existing state government medical colleges after their upgradation under the scheme. The total proposed outlay of the central government is Rs. 7500 crores. The funds would be provided for equipment and infrastructure by the central government after gap analysis by the technical committee. The scheme has the provision of fund sharing between the Central Government and States in the ratio of 90:10 for NE/special category states and 75:25 for other states. The upper ceiling of cost per MBBS seat is Rs. 1.20 crore. This ongoing scheme is proposed to be continued during the 12th Plan Period as the second installment has not yet been released to 72 medical colleges funded under the scheme. * The scheme envisages opening of 132 ANM (@ Rs. 5 crore per school) and 137 GNM Schools (@ Rs. 10 crore per school) in districts where there are no such schools. * 117 ANM and 137 GNM Schools have been approved under the scheme. * A sum of Rs. 616.51 crore has been released under the Schemeupto 31.03.2013. * Scheme envisages financial assistance for strengthening/upgradation of State Nursing Councils to the tune of Rs. 1 crore per Nursing Council. * Rs. 14.90 crore has been released to 15 states @ Rs. 1 crore (Rs. 0.90 crore in respect of Delhi) has been released under the Scheme for strengthening and upgradation of Nursing Councils/Cells. * Rs. 58.575 crore has been released for strengthening of 62 andupgradation of 17 Nursing Institutions. * A scheme for establishment of 6 Colleges of Nursing at the sites of AIIMS like institutions at the cost of Rs. 120.00 crores is under implementation. One National Institute of Paramedical Sciences (NIPS) at Delhi and 8 Regional Institute of Paramedical Sciences (RIPS) at Chandigarh, Lucknow, Bhopal Hyderabad, Coimbatore Bhubaneswar, Aurangabad and Bhagalpur are being set up at a total provision of Rs. 1156.43 crore. For establishment of RIPS and NIPS and to enable State Governments to start Paramedical courses in State Medical Colleges, a sum of Rs.107.80 crore has been released. Under “Strengthening/Up-gradation of Pharmacy Institutions” scheme, with a total outlay of Rs. 85 crore, pharmacy institutions are being provided financial assistance in the form of one time grant-in-aid for strengthening/up-gradation of pharmacy institutions and for conducting continuing education programme for faculty in pharmacy institutions and practicing pharmacists.